The Guest House at Seatuck Farm is located on a gently sloping site west of Seatuck Farm’s Main House where Seatuck Creek and Little Seatuck Creek converge before emptying into Long Island’s Moriches Bay. Much of the property is protected wetlands with natural vegetation that includes reeds, scrub pine and oak trees. The property’s exposure to ocean storms requires pile foundation construction and minimum floor elevations at 14 feet above sea level. In addition to the usual requirements for guest accommodations, the Owner asked that a dining space be provided for dinner parties too large for the main house. He asked that the dining space be a unique form that responded to the amenities of the site and to the curved geometries of the existing main house. The Owner also requested that the house be comprised of several distinctive pavilions that would create a small village or resort aesthetic. And, despite the construction requirements of the site, he asked that the house be well integrated with, and accessible to, the natural landscape. 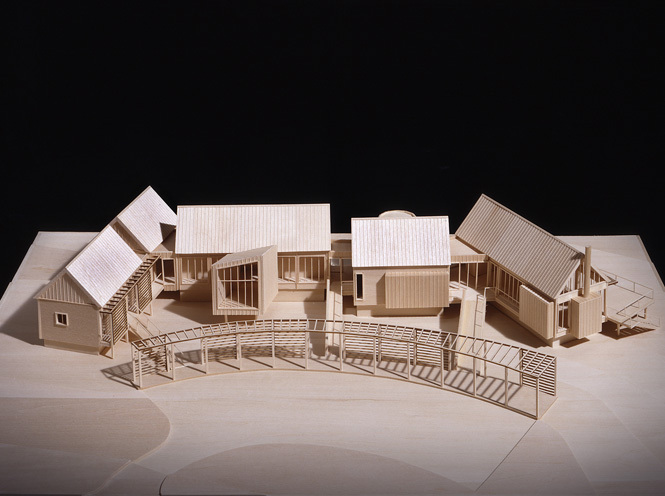 The Guest House design is comprised of six interconnected pavilions and two semi-detached pavilions, each identifiable in shape, form and function. The interconnected pavilions are formally arranged around a landscaped courtyard which serves as a buffer zone to the drive court above and an entry court for arriving guests. The semi-detached pavilions are designed as independent objects and are placed along the sides of the formally arranged interconnected structures.